Vegans exclude animal by-products - like eggs, butter and milk, common staples in many cake recipes - from their diet. Fortunately, by making some easy substitutions, even the most devoted vegan can have their chocolate cake and eat it too! This delicious cake yields 10 servings of chocolaty goodness. Lightly spray two 8-inch round cake pans with nonstick spray, dust with cocoa powder, and shake out excess. Set pans aside for later use. Combine almond milk and vinegar in a large mixing bowl, and let rest for at least five minutes, or until mixture has thickened. Add oil, coffee, vanilla extract, and applesauce to milk mixture, and beat until foamy. Add flour, sugar, cocoa powder, baking soda, baking powder, and salt to wet ingredients, and mix until thoroughly combined. Divide cake batter evenly between two cake pans. Bake 25 to 30 minutes, or until a toothpick inserted into the center comes out clean. Allow cakes to rest on a baking rack until completely cool, then frost with chocolate or cream cheese vegan frosting. 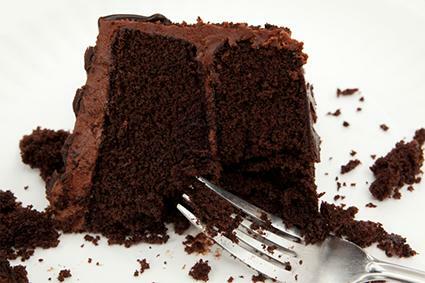 Individuals who are interested in converting their own chocolate cake recipe into a vegan alternative typically need to identify alternatives for eggs, butter, and milk or buttermilk. When it comes to finding a substitution for eggs in a chocolate cake recipe, the sky is nearly the limit. In fact, People for the Ethical Treatment of Animals notes that one banana or a quarter-cup of applesauce can effectively replace each egg called for in a chocolate cake recipe. Individuals who do not have these ingredients on hand may also use potato starch, mashed potatoes, pumpkin, squash, or date puree. Coconut oil is a great alternative to butter when it comes to baking, reports VegNews, as it mimics the thickness traditionally achieved by butter in baked goods. Canola oil, margarine, and even ground nuts are also a safe bet when it comes to replacing butter in a chocolate cake recipe. Use the same amount of these ingredients as you would butter for optimal results when it comes to baking a vegan chocolate cake. Milk is perhaps one of the easiest vegan substitutes to make, notes VegNews, as there are so many tasty alternatives already available on the market. Use soy, rice, almond, or coconut milk in the same amounts as you would regular milk in a vegan chocolate cake recipe. If your favorite chocolate cake recipe calls for buttermilk, do not fear. To make one cup of buttermilk, simply add one tablespoon of distilled white vinegar to a cup of soy, rice, almond, or coconut milk, and allow to rest for five minutes before incorporating into the recipe. This rest period allows the vinegar to interact with the milk, thickening it, and helping to promote a texture that is closer to that of traditional buttermilk. A slice of chocolate cake is the perfect ending to any meal. Fortunately, vegans can enjoy this tasty treat by following a recipe that has been modified to exclude eggs, butter and milk. Try it at your next dinner party - chances are, your guests won't even be able to tell that it is vegan!